Here’s our story. Stamford Fireplaces began more than 40 years ago with one person selling wood stoves in a hardware store, which later became Stamford Home Hardware. Within 10 years, gas products were added and a great cash and carry business began, sending customers elsewhere for installation services. A few short years later, installers were hired from within and customers were more comfortable with this way of doing things. A small showroom was added at the rear of the store. By 1994, there was a staff of 7 people and business was booming. It was also in 1994 that Kathy Kostyk (later to become Kathy Morningstar) arrived on the scene as a sales associate. By 1996 she was the manager and in 2007, she became a full partner. In August of 2014, Stamford Fireplaces moved to a new facility on Oakwood Drive in Niagara Falls. We are proud to share our beautiful showroom and design centre with our customers, builders, architects and designers. Whether you’re looking for a gas fireplace to warm the house or a chimney sweep for spring cleaning, we help bring the perfect touch to your home – and offer free in-home estimates for all of our customers. With a design centre featuring rows upon rows of display units for viewing, you’ll find what you’re looking for at Stamford Fireplaces – and if you can’t, just ask. We can get just about anything out there. Homeowners can count on Stamford to help with everything from keeping out of the cold to building a beautiful indoor or outdoor space. 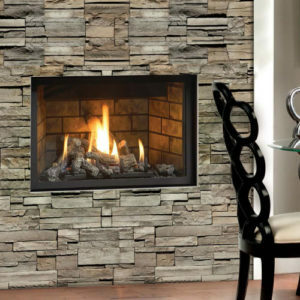 With our large selection of quality products and services, free in-home estimates and a fresh Dealer of the Year Award for 2014, we’re your source for gas and wood burning products in Niagara! Whether you’re starting from scratch and need help finding a wood or gas burning product or know exactly what kind of fireplace you’re looking to add to your home, we’re here to help you at your convenience. Ready to get started? Contact us for more information and to book a free in-home estimate or stop by our design centre today!